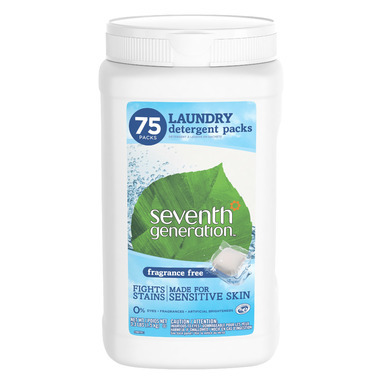 Seventh Generation Fragrance Free Laundry Packs are the hypoallergenic, stain fighting, fast-dissolving, one-step solution to your laundry routine. Packed with quadruple enzyme stain fighting enzymes these detergent packs get your clothes clean without any iffy chemicals. They are free from common skin irritants like fragrances, dyes and artificial brighteners. Dermatologist tested, Seventh Generation Free and Clear laundry packs are gentle even on sensitive skin. For more than 25 years, Seventh Generation has been thoughtfully formulating safe and effective plant-based products that work. Really well. Ingredients: Sodium citrate (plant-derived water softener), sodium carbonate (mineral-based cleaning agent), laureth-6 (plant-derived cleaning agent), hydrated silica (mineral-based flow aid), cocos nucifera (coconut) oil (plant-derived anti-foaming agent), protease (plant-derived enzyme blend soil remover), amylase (plant-derived enzyme blend soil remover), mannanase (plant-derived enzyme blend soil remover), cellulase (plant-derived enzyme blend soil remover). Just did 3 loads of laundry with these pods and there was no residue, no pieces, and no scent. Perfect! This is a great product. So simple to use (just pop a pod in the dishwasher). If your house is like our house, you will need to run the water to ensure that it's HOT by the time it gets to the dishwasher so that the soap gets fully dissolved. I'd say this is my 2nd favourite bio-friendly dishwasher pods. And I've tried a lot of them!